Literally located in the shadow of Mt. Washington, Wildcat Mountain has long been a New England skiing destination. The skiing history on Wildcat Mountain dates back to 1933, when the Wildcat Ski Trail was cut by the Civilian Conservation Corps. Designed by Charley Proctor, the trail ran from a warming hut near the summit of "E" peak to the base of the mountain. Prior to the rise of lift served skiing, the Wildcat Ski Trail was one of the top racing destinations in all of New England. In the mid-1950s, the United States Forest Service gave Mack Beal, Brooks Dodge, George Macomber, and Malcolm McLane permission to start developing a commercial ski area on Wildcat Mountain. The first development of its type in the White Mountain National Forest, the new ski area would incorporate the Wildcat Ski Trail into its trail network. A 3,000 foot T-Bar likely opened on the lower slopes of Wildcat in January of 1958, as Bill Boardman served as manager. An opening ceremony was held in the rain on January 25, with Governor Lane Dwinell present. 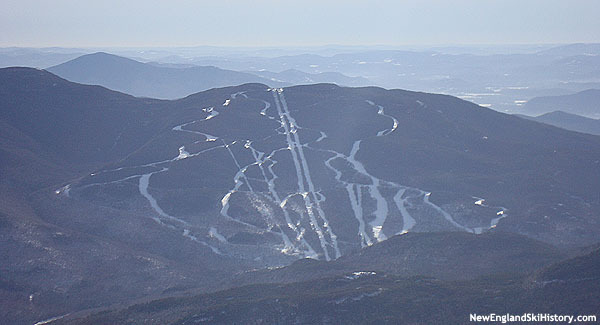 Midway through the season, the United States' first ski gondola opened, instantly making the $1.5 million dollar Wildcat development one of the largest ski areas in the Northeast. At the time, the area was seen as a possible venue for the 1972 Winter Olympics. Running from the base of the ski area to the saddle between Wildcat D and Wildcat E, the Italian Carlevaro & Savio two person gondola provided over two thousand continuous vertical feet of skiing on the Wildcat and Polecat trails. Unfortunately its first season was not without incident, as a mechanical malfunction on March 24, 1958 resulted in the hospitalization of two riders. The lift was subsequently retrofitted to fix the issue. While Wildcat enjoyed large crowds, it quickly developed a reputation for being overly challenging. Its easiest trail from the top, the Polecat, featured multiple steep stretches that have since been bypassed or altogether abandoned. For 1959-60, the trail was heavily manicured to appeal to the growing number novice-intermediate skiers. Meanwhile, a 1,100 foot novice T-Bar was installed just beyond the original T-Bar, serving two slopes. The Boston Globe claimed the changes had "clipped Wildcat's claws." 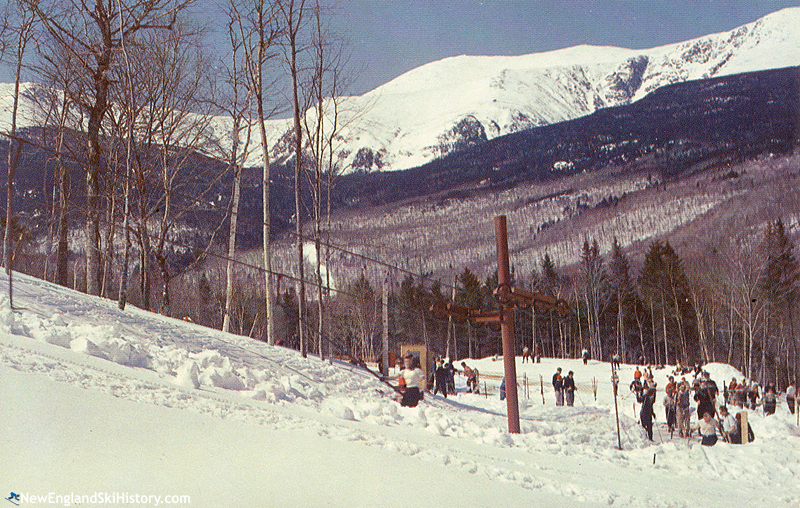 The popular intermediate Alley Cat trail made its debut for the 1960-61 season, accessible by both the gondola and original T-Bar. A rebuilt Route 16 opened in 1961, making for easier travel between Conway and Wildcat. More noticeably for Wildcat, Route 16 was relocated across the Peabody River, resulting in a much larger base area. While Wildcat's gondola was its major draw, it was also its Achilles heel. Being the only upper mountain lift, lines were often prohibitively long. As a result, the Catapult chairlift was installed on the upper mountain, accessible from the original T-Bar or gondola. Initially advertised for the 1962-63 season, it likely was not completed until 1963-64. Also completed for the 1963-64 season was the Lynx trail, which may have debuted as a rough trail the year before. While the late 1960s involved lots of grass for some, it meant lots of snow for Wildcat. The 1968-69 season started off with a bang, as the Wildcat trail opened top to bottom in November (General Manager Stan Judge noted it was the first pre-February top-to-bottom opening of that trail in the area's history). One particular storm in February of 1969 briefly crippled the ski area from snow drifting. 10-15 foot drifts clogged the summit terminal of the gondola, while a bulldozer had to be used to clear the T-Bar and chairlift lines. 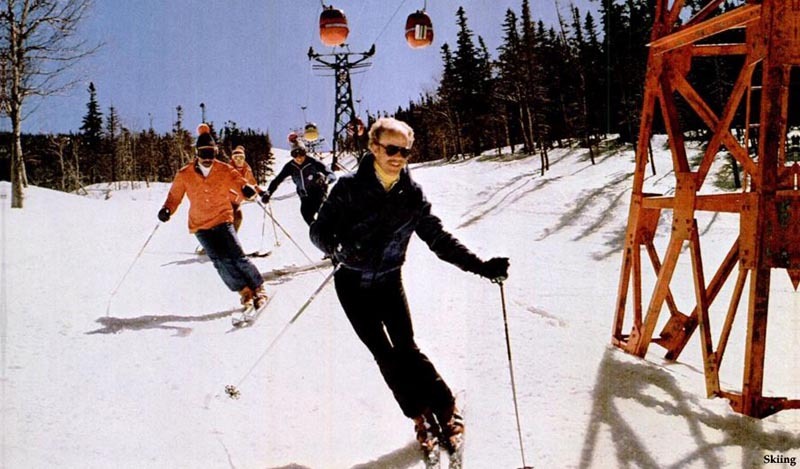 The Lynx double chairlift was installed in 1970, taking stress off the gondola and lower mountain T-Bars, while also providing top to bottom chairlift service in conjunction with the Catapult. Base operations were also boosted that year, as the first 9,000 feet of the present day main lodge opened. As was the case across New England, Wildcat was hit hard by the 1973-74 season, failing to open until January 2. A subsequent January thaw, along with the energy crisis, resulted in a 40 percent drop in business. 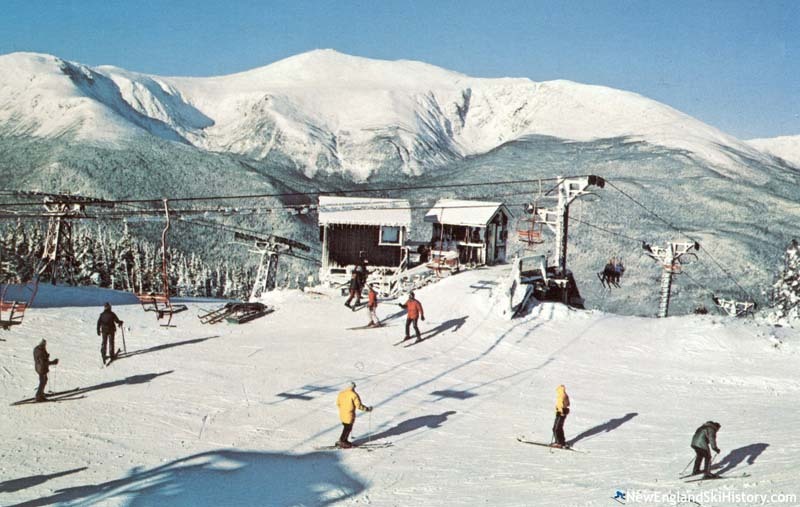 Despite the rough season, Wildcat invested in its first triple chairlift in 1974, replacing the novice T-Bar. After a successful 1974-75 season, snowmaking was finally installed. Over the next two decades, snowmaking was gradually installed on most of Wildcat's main trails. Another sizable investment took place for the 1982-83 season, when the original T-Bar was replaced with a new triple chairlift. In 1986, the Franchi family, owners of the Cranmore Tennis Club, purchased Wildcat ski area. The following year, a $1.6 million spent on upgrading the Catapult chairlift from a double to a triple, as well as installing the Tomcat triple. In conjunction with this project, the Polecat was reworked. Wildcat found itself in a dispute with the United States Forest Service in 1989, when the agency recalculated the area's lease and sent a large retroactive bill. Though the Forest Service threatened to shut down Wildcat as the 1989-90 season arrived, the matter was eventually resolved. The ski area was forever changed in 1997 when the Wildcat Express was installed. The Doppelmayr high speed detachable quad cut the 2,041-vertical-foot ride to the summit to 6-minutes. Gondola cars were later purchased for summer use on the new lift. Following the 1999 fall season, the original gondola was decommissioned. The gondola cars were auctioned in March of 2000. The lift towers, as well as those from the Lynx double were removed during the next few years. 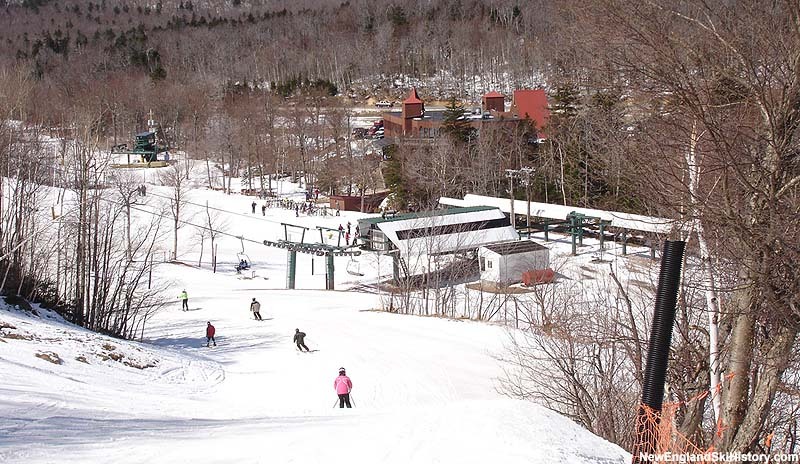 On October 21, 2010, Peak Resorts, owner of nearby Attitash, announced it had entered into a purchase and sale agreement with Pat Franchi to purchase Wildcat. Since the sale, Peak Resorts has worked on developing synergy between the two areas. After major snowmaking system issues in 2013-14, Peak Resorts overhauled Wildcat's system, installing new pumps, pipe, and snowguns, including equipment procured from the liquidation of Ascutney in Vermont. Since then, Wildcat has focused on having the first and last 2,000 vertical foot skiing in New England each season. "we had 4 life time passes. 3 g3nerations of loyal skiers. we aps dlso have a gondola in out front yard. Beverly and Burt"
"I have been skiing Wildcat for years..I never remember Catapolt double being up grated to a triple...I remember the double, with the pole in the middle of the chair...anyone out there remember riding a Catapolt triple??" "I grew up skiing Wildcat Mtn. Even bought myself a 'Wildcat Parka' from the Jack Frost Shop in Jackson back in the '60's! Loved the entire area; the whole State of New Hampshire always felt like my second home." "(The press release below was originally released July 25, 2011 and the intent had been to remove the building during the spring of 2012. Because of weather/conditions that season, delays occurred and full removal was rescheduled for spring 2013. A short video marking the occasion and showing the final removal May 18, 2013 can be seen here: http://youtu.be/iAFNzhxnVAQ)After considering all reasonable options, and working with U.S. Forest Service to understand codes and requirements to renovate the existing summit building that once served as the top-station for the original Wildcat Mountain gondola, Peak Resorts has determined that the capital expense is not feasible and instead budget the costs and expense to dismantle, remove, and restore a small, but noticeable, portion of the natural summit.�You have to admire and respect the history and the individuals that built what remains of the original, but long neglected, infrastructure here�, said Wildcat Mountain General Manager Josh Boyd. �But we�re in a different era with extensive building requirements and regulations that the U.S. Forest Service has in place to preserve the natural beauty of the White Mountain National Forest. And I have worked with them to understand and fully study what was possible, but building codes and related costs would require us to rebuild the building almost entirely. At this time, we feel the significant capital expense to build at the summit is better spent to simply remove the structure next spring, restore a bit of the natural beauty at the summit, but leave a defined footprint that may allow the U.S. Forest Service to permit a building in the unforeseeable future, and to allocate any immediate capital expenses to other more pressing improvements here at Wildcat.� Boyd went on to say that an expense of this proportion to create a minor profit center that may never fully see a break-even return to simply even operate season-to-season, is just the type of thing that challenges any ski area owner or operator to have to consider increasing the price of lift tickets and season passes.Of note, the Mount Washington Observatory has already taken immediate action to relocate their summit web cam and Wildcat Mountain has worked and cooperated to provide an alternate location. Known for its legendary views of Mount Washington and Tuckerman Ravine, Wildcat Mountain is host to one of many summit cams that the Mount Washington Observatory website shares with its members and general public."